Diabetic retinopathy is an eye condition that can develop in any person with type 1 or type 2 diabetes. Diabetes affects the tiny blood vessels in the body, and the microvascular changes that occur in this disease affect the retina, which is where the light is focused in the back of the eye. This condition typically affects both eyes. Often, the early stages of diabetic retinopathy have no symptoms, and therefore it is important to have a regular comprehensive dilated eye exam with your eye doctor to detect and treat the condition before it does permanent damage. Diabetic retinopathy may begin prior to the diagnosis of diabetes, especially in Type 2, or adult onset diabetes. Poor control over blood sugar levels, high blood pressure, high cholesterol, pregnancy, and tobacco use increase the risks of severe and often profound visual loss. Over time, excessive sugar in the bloodstream can lead to blockages that occurs in the tiny blood vessels of the retina. Lack of oxygenation in the retina induces new blood vessel growth or neovascularization. When new blood vessels attempt to grow they are likely to develop poorly and can often leak. Sustained high blood sugar levels can cause swelling in the central part of the eye called the macula. As a result from the abnormal growth of blood vessels in the retina, serious complications may occur leading to vision loss if not treated. Careful management of your diabetes is the best way to prevent vision loss. 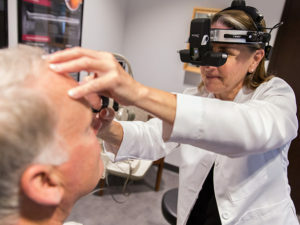 There are numerous treatments for retinopathy including intravitreal injections, topical medications, long acting steroid injections, laser, and surgery when necessary, depending on the severity of the disease.